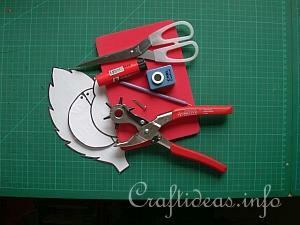 The patterns are large enough and simple enough for even younger kids to cut out. Parents will need to assist with the smaller pieces and the details. 1. 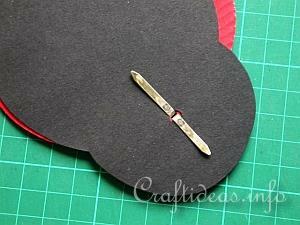 Create your templates and gather the supplies you need to make this decoration. 2. 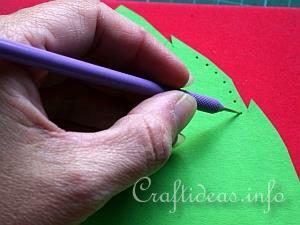 Take your templates and now trace them on the appropriate colored cardstock or corrugated cardboard. Either cut out or punch out the 10 black spots and one white spot. 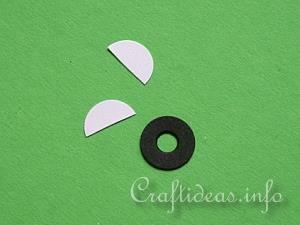 Using your hole punch, punch also the holes in the head and the wings where the small markings are on your pattern. 3. Cut the white spot in half. This will be the eyes. Also punch a hole through one of the black spots. 4. 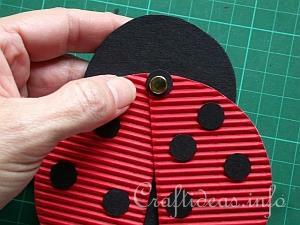 Glue the spots on both wing halfs. The spot with the punched hole now gets placed on the brad. Now insert the brad through the 2 wing holes and through the head. 5. Close the brad on the back side of the head. You will now be able to open and close the wings. 6. 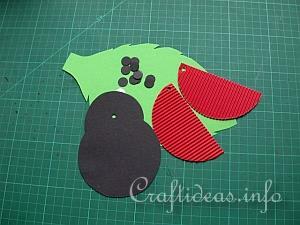 Lay your leaf on the piece of fun foam or on a towel. 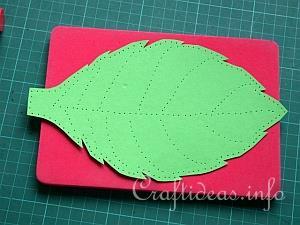 Take your needle or your perforation tool and punch holes alongside the edge of the leaf. 7. Also punch where the leaf vein lines should be. This is how it looks when it is finished. The holes make a nice effect and also let light through the leaf when it is hanging in the window. 8. 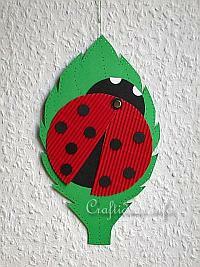 Glue the lady bug now on the leaf. 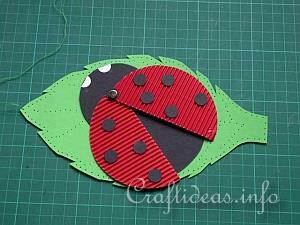 Insert a thread through one of the top holes of the leaf and knot. Now it can be hung up.